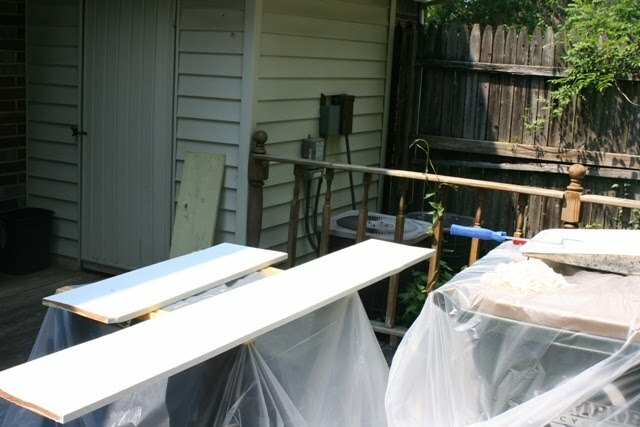 Today (May 30 – again posting a day or so late), the progress on the Shire renovation project saw painting done in two of the closets. In each case, the ceiling and the walls were painted. The woodwork remains to do. That will be the task for tomorrow. The strategy here is to finish the closets so they can be used as storage. This is especially needful since Tricia and Irene will be staying here on Tuesday. The X-Men marathon was completed successfully while working on various projects for which I get paid. This should have been posted yesterday – May 29, 2010. The plan for today (May 30) is to paint the two closets and fill out the vouchers on Behr paints. After the work, I finished watching Dances with Wolves. Eric and I had started it Friday evening – after Iron Man 2. The day’s big news is that Sean did a half-marathon in Madison. I am extremely proud of him. I do need to point out that I am engaged in an X-Men marathon (Eric left his videos at the Shire). Seriously, though, Sean’s effort has inspired me to go into extensive training for the half-fifty yard walk. But now – off to lunch and then to the painting. The Shire, consistently ranked as Louisville’s finest bed, has important news for all our regular guests, our potential guests, and . . . our other guests (irregular just does not fit some how). The Shire, grand old bastion of fine sleeping in Louisville, is receiving a makeover. Phase One of the much-needed and long-anticipated renovation has begun! You can count on the same sterling service (we’ve retained the cleaning dwarves and the transportation elf) but in much more pleasant surroundings. All services provided in the past will be provided in the future. 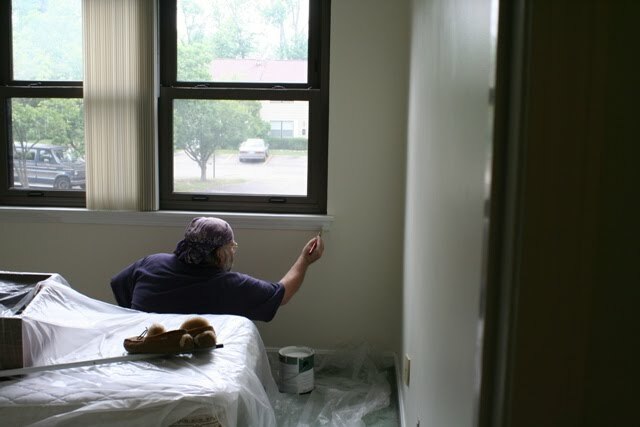 With a massive jump-start by hobbit friend Mary Lidtke and support from son Eric, the first room has been painted. Technically it still needs to be cleaned and redecorated – but why quibble about details – it is no longer green! Some staff members wanted to continue to work today, but others are so giddy at no longer seeing green everywhere, that we are headed to Smoothie King to celebrate!! In fact, those who extend their stay and help with the renovations may receive rebates. Frequent Shire points remain good. Remember, when the trail brings you Louisville way, the Shire has a bed for you. I get a one out of three today. I ate well. No focused walking and only 4024 steps. But not eating is a start. Went to see Robin Hood with Eric and Sparky. Good flick. Russell Crowe and Cate Blanchett good as always. An interesting spin on the story. And a set up for a sequel. Off to bed to get some sleep before an 8:00 am meeting. Overate – but did avoid eating foods with large quantities of sugar. There was this doctor who used to say that it is better to eat apples than Oreos. Did not make it to the gym – still nursing a blister. But it is getting better. Did walk for 10,102 steps. The Penguins lost. I suppose I can’t really set a goal for a situation in which I have no control, but it would have been nice for them to win. Did catch the end of The Outlaw Josey Wales on the tube after the hockey loss. Whenever I try to get back in the exercise groove, I have a tendency to overdo things – to go too hard too quickly. Where this usually plays out is in a blister on my foot. This time is no exception. So today, instead of doing nothing and instead of going all out, I took it easy and spaced my walking. I made it to the gym, but went 20 minutes on the treadmill instead of 40. I needed some groceries so I walked around the store for about 20 minutes. I found a couple of other times to walk just a little bit longer. I suppose I did not make the letter of the goal for focused exercise. But I believe I achieved the spirit. I did eat well. And I did make 10,392 steps. I am calling that all three goals met. Four days. Neither the Cavaliers nor the Pens played today. I did a Netflix video about Bonhoeffer. At the gym, I watched the Phoenix Los Suns game against San Antonio. It’s a pretty good gesture. And now I am hooked. I am watching the end of their game and they will be my second team. Quick post tonight – had planned to go longer – but need to post on the Peacemaking Program blog about folks who are going to the Philippines as election observers. Say a prayer for the people of the Philippines and those who plan to serve as election observers. Went to gym for first time in long time. 40 minutes on treadmill. Remembered how to use it.